Since the one crafts shop I visited also sold leather belts and wristbands, I started contemplating Steampunk bracelets. Jackpot! At first glance, the plastic body and rubber shell makes it completely unfit for Steampunk. But the rubber is really just a cover, and it was easy to plop the compass out. The compass itself is of the simplest kind: A plain plastic disk, transparent, filled with a liquid, and unlabled. “Neutral” enough, I think. I simply drew a picture of an old-fashioned compass rose, using an 8-spoked gear stamp as template, and placed it under the transparent compass body. The white foundation of the compass rose is glow-in-the-dark paint, by the way. 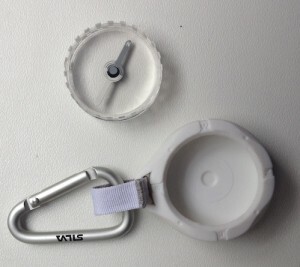 As compass mount, I used a ring-shaped hose clamp from the fleamarket. The clamp also got two drops of glow paint, for good measure. Then I tied it all together with some white leather straps. Using such a tiny compass comes at a price, though: Any piece of metal causes interference! I walked 10 metres in what I knew was a northern direction, and the compass happily pointed 1st at the fridge, 2nd at my phone, and 3rd at the hose clamp — all of which were positively not north. Oh well.